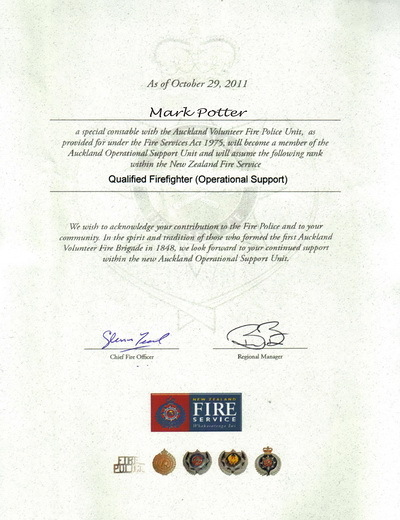 The Unit had to change its name and identity following the New Zealand Fire Service's policy decision in November 2010 to phase out Fire Police. Section 33 in the Fire Service Act (giving Fire Police the powers of a police constable while on the fireground) would be repealed, it was decided, and that all Fire Police would, henceforth, be called Operational Support. The policy, thus, created a new entity within the New Zealand Fire Service. Those personnel transferring from Fire Police would continue to be members the Fire Service and their "home" Fire Brigade, with assured tenure. The new policy means Operational Support is standardised throughout the country: a set of Operating Procedures have been issued, members take fire-fighters' ranks, enjoy a matrix of approved protective uniform and equipment, have a confirmed list of duties they might carry out and, finally, they will have their own progressive training programme (TAPS) which will be devised for both recruits and in-service personnel. October 29th 2011 was chosen as the date the Unit would transform from the Auckland Volunteer Fire Police to Auckland Operational Support. As of this date the name Fire Police would disappear in Auckland... from uniform, from sign-writing on appliances, from stationery, from the web-site and from radio call-signs. Members would take on the new ranks, be issued with appropriate rank insignia and new name badges. 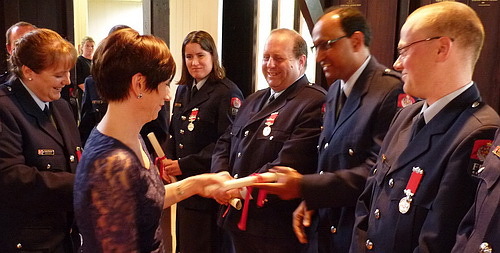 A function was held on the evening of October 29th 2011 to mark the defining date, a milestone in the Unit's history, to farewell Fire Police, to reflect on the Unit's 78 years in Auckland and to introduce the new Operational Support. Courtesy of our member, Bishop of Auckland, Senior Station Officer Ross Bay, the function was held at the historic Selwyn Library, Bishopcourt, in Parnell. Climax of the evening was the presentation of a personal certificate to Fire Police by Board Member of the New Zealand Fire Service Commission, Vicki Caisley. The presentation to each member marked the moment they transitioned from Fire Police to the new Operational Support, at the same instant discharging them from their oath of constable. Ms Caisley thanked members for their past volunteering with the old Fire Police and encouraged them, having made the change, to continue in Operational Support. She assured members of backing from the Commission, saying she admired the dedication of volunteers in brigades throughout New Zealand.